The Flock of Geese quilt block looks rather simple at first glance -- and the good news is that it is an easy block to construct. But, don't let 'simple' fool you. There is a multitude of ways to lay out your quilt and make a totally different result than your friend -- all with this easy quilt block. This is evidenced in the two sample quilts illustrated. Imagine what you could come up with just with a few rotations of the block here and there. This quilt block is made entirely of half square triangles. in two different sizes. This four patch block is fun to use to play around with your scraps to make any number of colourful quilts. 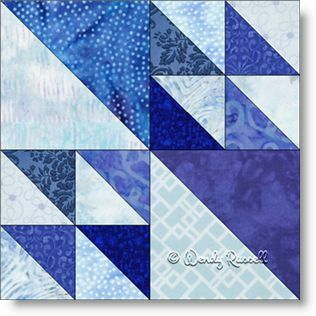 I have chosen to make a 'blue' quilt, with all sorts of different darks and lights in a variety of blues.